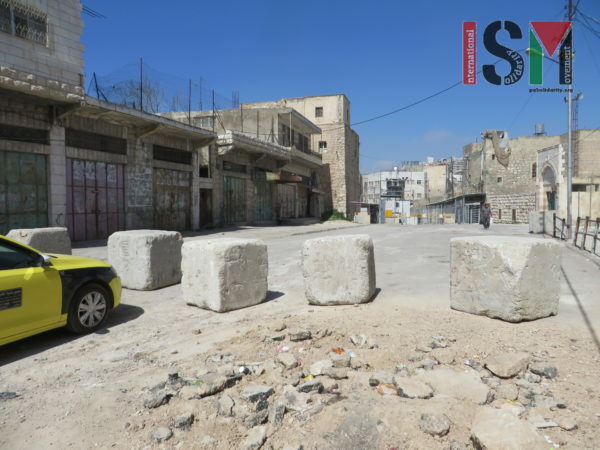 Israeli forces on Monday night installed more concrete blocks near Queitun checkpoint in occupied al-Khalil (Hebron) further restricting Palestinian freedom of movement. Israeli forces put a new line of cement blocks several meters away from Shuhada checkpoint, entirely blocking the access to the checkpoint for cars, only allowing Palestinians on foot to approach the checkpoint. This even further impedes the freedom of movement of Palestinians, and especially affects the elderly and people with disabilities, further clamping down on the already restricted movement of these most vulnerable groups. Accessing and passing checkpoints is only possible on foot, as Palestinians’ cars in the Ibrahimi Mosque area are entirely prohibited, creating a settler cars only area. Any Palestinian passing one of the many checkpoints in the area of the Ibrahimi Mosque is forced by the Israeli forces to pass through various turn-stiles, a metal detector, and to undergo a check supposedly for ‘security reasons’. Especially for the elderly and those with disabilities, this creates additional obstacles, as they have to wait standing or in wheelchairs until soldiers choose to open gates. Any materials, groceries or shopping has to be carried by hand through the checkpoint, and materials transported on a hand cart are at times denied to pass according whim. Now, with the additional concrete blocks, any Palestinian coming by car, including those with mobility problems, must walk even further simply to reach the checkpoint. Slowly and surely, one by one, these measures are intended to restrict and minimize Palestinian freedom of movement and thus Palestinian presence in the area around the Ibrahimi Mosque. Each is a small step in the gradual ethnic cleansing of Hebron centre.